This rare and exceptional piece consists of a solid walnut top of square shape with canted corners (or it could also be termed as an irregular convex octagon) of superbly fine patina (colour) with intarsia geometric decoration of stained woods. This leads down to finely carved decoration on all eight sides consisting of an egg and dart design with a dental moulding below with an intarsia inlaid border of geometric three dimensional rectangles (or cuboids) leading down to a superbly carved and pierced Gothic design frieze leading down to further intarsia inlaid design of possibly a cylinder or prism with a moulding below. The cupboard consists of a moulded solid walnut door with original hinges and steel lock, the door having a recessed panel and moulded frame with intarsia decoration, the door opening to reveal a storage area with shelf and evidence of inventory label to reverse of door. The canted corners of the cupboard consisting of inlaid stringing decoration of stained light and dark woods having the appearance of a recessed panel, the sides and back all consisting of a moulded recessed panel with a border of intarsia decoration consisting of a diamond design. The base consists of a moulding with intarsia inlaid borders of geometric three dimensional rectangles, all supported on a bold moulded base. The ‘Sacristy’ cupboard was a cupboard in a Church in which sacred vessels, books and vestments etc. were kept. Renaissance artists developed new artistic techniques including the formulation of perspective: they wanted to create something that would closely resemble reality: the ‘intarsia’ inlay technique in Italy consisted of fitting pieces of wood together to create an image or an illusion of depth, the ‘intarsiatori’ (those who created the intarsia work) were known as the ‘masters of perspective’. The intarsia work appears to have started in Siena where there is a record of a long list of masters who were then sent to other cities to create important work such as in Florence. Many celebrated painters were also known to have worked in intarsia such as Taddeo Gaddi and Giuliano di Nardi who created works for the sacristy of Santa Maria Novella as well as works in the sacristy of the Duomo of Florence in 1465. The capital of Tuscany, Florence, became a cultural centre and led all the arts in the 15th century and also during the later Renaissance even after losing her position as centre of the arts still maintained a high standard that rival areas sought to emulate. This period was an extremely important time for artists in Florence and it greatly influenced artists, architects and sculptors such as Brunelleschi, Michelangelo, Leonardo Da Vinci, Botticelli and Giotto to name but a few – the artists of this time produced amazing works that we all continue to greatly admire and wonder at. An item such as this walnut sacristy cupboard rarely come on to the open market as they tend to be housed in collections and museums. 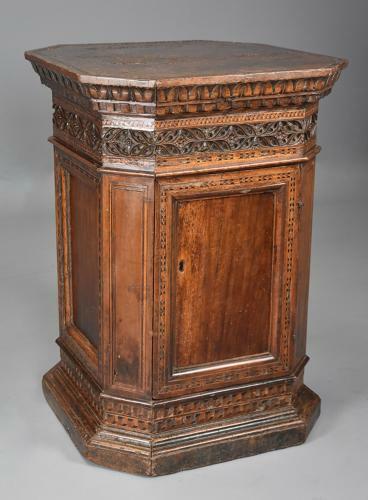 This cupboard has evidence of old restorations with some losses of intarsia but overall is in very good condition considering the age, it is of stable construction and can go straight into a home or collection – it can be used as a cupboard or equally would be a wonderful pedestal to display a piece of sculpture. The cupboard has undergone professional treatment for woodworm etc. – a certificate will be provided on purchase. Provenance: information we have will be supplied to purchaser. Please note: the marble bust shown on one of the images is not included in the list price - please contact for further information.